Many oil wells burn off methane—the largest component of natural gas—in a process called flaring, which currently wastes 150 billion cubic meters of the gas each year and generates a staggering 400 million tons of carbon dioxide, making this process a significant contributor to global warming. Letting the gas escape unburned would lead to even greater environmental harm, however, because methane is an even more potent greenhouse gas than carbon dioxide is. Why is all this methane being wasted, when at the same time natural gas is touted as an important "bridge" fuel as the world steers away from fossil fuels, and is the centerpiece of the so-called shale-gas revolution? The answer, as the saying goes in the real estate business, is simple: location, location, location. The wells where methane is flared away are primarily being exploited for their petroleum; the methane is simply a byproduct. In places where it is convenient to do so, methane is captured and used to generate electrical power or produce chemicals. However, special equipment is needed to cool and pressurize methane gas, and special pressurized containers or pipelines are needed to transport it. In many places, such as offshore oil platforms or remote oil fields far from the needed infrastructure, that's just not economically viable. "This finding opens the doors for a new paradigm of methane conversion chemistry," says Jillian Dempsey, an assistant professor of chemistry at the University of North Carolina, who was not involved in this work. Existing industrial processes for converting methane to liquid intermediate chemical forms requires very high operating temperatures and large, capital-intensive equipment. 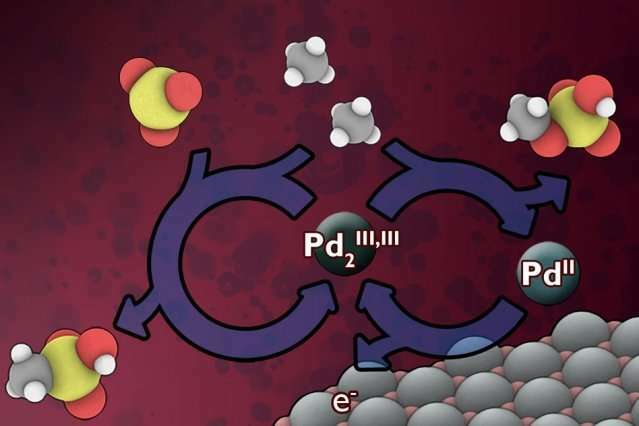 Instead, the researchers have developed a low-temperature electrochemical process that would continuously replenish a catalyst material that can rapidly carry out the conversion. This technology could potentially lead to "a relatively low-cost, on-site addition to existing wellhead operations," says Surendranath, who is the Paul M. Cook Career Development Assistant Professor in MIT's Department of Chemistry. The electricity to power such systems could come from wind turbines or solar panels close to the site, he says. This electrochemical process, he says, could provide a way to do the methane conversion—a process also known as functionalizing—"remotely, where a lot of the 'stranded' methane reserves are." Already, he says, "methane is playing a key role as a transition fuel." But the amount of this valuable fuel that is now just flared away, he says, "is pretty staggering." That vast amount of wasted natural gas can even be seen in satellite images of the Earth at night, in areas such as the Bakken oil fields in North Dakota that light up as brightly as big metropolitan areas due to flaring. Based on World Bank estimates, global flaring of methane wastes an amount equivalent to approximately one-fifth of U.S. natural gas consumption. When that gas gets flared off rather than directly released, Surendranath says, "you're reducing the environmental harm, but you're also wasting the energy." Finding a way to do methane conversion at sufficiently low cost to make it practical for remote sites "has been a grand challenge in chemistry for decades," he says. What makes methane conversion so tough is that the carbon-hydrogen bonds in the methane molecule resist being broken, and at the same time there's a risk of overdoing the reaction and ending up with a runaway process that destroys the desired end-product. Catalysts that could do the job have been studied for many years, but they typically require harsh chemical agents that limit the speed of the reaction, he says. The key new advance was adding an electrical driving force that could be tuned precisely to generate more potent catalysts with very high reaction rates. "Since we're using electricity to drive the process, this opens up new opportunities for making the process more rapid, selective, and portable than existing methods," Surendranath says. And in addition, "we can access catalysts that no one has observed before, because we're generating them in a new way." "This work really stands out because it not only reports a new system for selective catalytic functionalization of methane to methanol precursors, but it includes detailed insight into how the system is able to carry out this selective chemistry. The mechanistic information will be instrumental in translating this exciting discovery into an industrial technology," Dempsey says. Or, from methane, as it is already present and essentially free and always available. Though in any case, the original logistics problem remains: the site is too far away from consumers and building a separate pipeline to pump the methanol out isn't cost-effective. Methanol can be stored in tanks and trucked out when it's more convenient. No pipeline needed. "Or, from methane, as it is already present and essentially free and always available." But yet they chose to tout renewables as a source of electricity as if the process could not stand on it's own merits using methane only. They are diluting the value of their own process and do not even realize it. If it's so little that it can be simply trucked out every now and then, it's not really worth the trouble driving all the distance to places where there's often no proper road infrastructure for trucks in the first place. Methanol wholesale prices round to about $1.20 a gallon, and a truck carries about 11,000 gallons, so each truckload is only worth about $10-15k on the market. What's the cost of the conversion plant? Millions? Times how many wellheads? It's going to need to do better than that to pay back. PS: BTW, what energy/fuel sources currently used by drill-rigs/well-head machinery/processing etc? Do they make use of some of the methane? @Reality - your post gave me a chuckle thank you. I hate to be the first one to point out the rather obvious fact that your pumps and pipes from each wellhead scales by the number of wellheads. Exactly you are not changing the scaling realities using your solution at all. And it seems like a installation/maintenance cost nightmare. Pipes are cheap, but they are also inherently leaky over long periods of time. If it was economical to pipe the methane to a central location for processing and transport, it would have been done already - conversion or not. The problem is exactly that you have small amounts of methane coming from numerous wellheads that are scattered over a thousand of miles of desert, and the value of each isn't enough to cover the system cost. You're simply trying to force the solution because you want to contradict me - you're playing an ego game - not because you want to evaluate whether it would actually work. I can't even remember any of that - and impotent to what? I'm not the one building chemical processing plants in the desert - I neither could nor would. If something works, it works despite the naysayers and negative opinions. If it doesn't work, it won't work no matter how much hype and positive thinking. Blame doesn't hurt it, and praise doesn't help it; the whole question of negative/positive thinking is a distraction by those who wish to make some technical matter or problem more than it actually is, for political or personal ends like pundits and hucksters. All ideas need holes poked in them, every insult and injury thrown at them to see if it holds. Otherwise you end up fooling yourself. For someone called RealityCheck, you seem to forget that quite often. That is the other part of the problem, the varying output, because the oil extraction rates follow market demands, while the gas output is fixed to the oil production, so when oil is in more demand the gas is flared because it cannot be sold at any reasonable price even if it were piped out. Supply has to meet demand. A chemical processing plant to turn the gas into more valuable chemicals would then have to be oversized in capacity to deal with the peak extraction rates, and thus more expensive on the end product, or undersized for the issue and unable to solve the need to flare. The article said they were looking at ways to integrate the converter into the wellhead itself. You wouldn't need to pipe methane, you'd have methanol. Liquids are easier and cheaper to send by pipe (lower pressure, etc. ), or to keep in tanks (no pressurization needed). It seems that the world's transportation system may be moving to hydrogen powered vehicles. Why can't this wasted methane be used to produce hydrogen instead of using natural gas to produce it? Ok. Sounds all good and sweet until you actually have to deal with methanol. Methanol is soluble in water, and very toxic to all life. It's not a good fuel for an advanced civilization. The article said they were looking at ways to integrate the converter into the wellhead itself. Which goes back to the point of, how much methanol do you get for what investment in the coverter? Mind you, the problem is still that you get varying amounts of excess methane at different times, so the utilization of the converter will be low. Because the methane is easier and safer to handle than hydrogen. And it -is- natural gas.